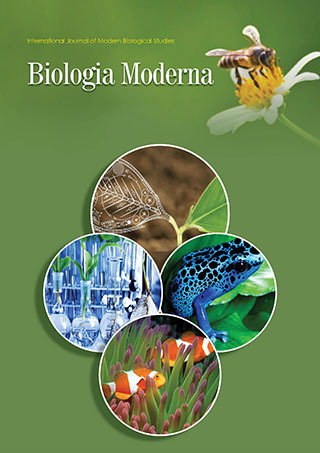 Biologia Moderna is a peer-reviewed, multidisciplinary online research journal that deals with varied interdisciplinary fields in biology, including evolutionary Biology, Cell Biology, molecular biology, systems biology, biomedicine, Cytokinebiology and Immunobiology. The journal offers a scholarly platform that elevates the images of the researchers and academia as internationally acclaimed scholars with its global presence. A group of esteemed and experienced editors are extending their patronage to the journal. Researchers can enrich their study by submitting manuscripts to the journal’s editorial board that comprises of scholars with proven abilities and established research track record. The submitted manuscripts are subjected to rigorous single blinded peer review before it gets published. Authors’ scholarly work undergoes critical scrutiny by the subject experts to ensure accuracy, validity and scientific relevance. Manuscripts will be published upon getting the final approval from the Editorial Board Members. The journal supports open access publishing to maximize the reach and visibility of the published research. The Editorial Manager System of the journal allows authors to submit article, track article status, respond to the reviewers’ comments, and revision requests. This multipurpose tool allows editors and reviewers to get access to the manuscript for review and to communicate with author. Biologia Moderna is indexed in Google Scholar. In PubMed: Selected citations only. The journal does not charge for submission. But a minimal charge is applicable for processing and publication of manuscript. Submit manuscript online at www.editorialmanager.com/longdomjournals or as E-mail attachment to [email protected].